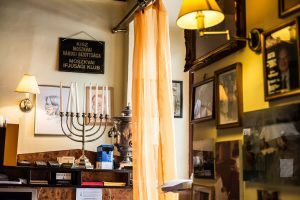 Walking into Rosenstein, Budapest’s most revered Hungarian-Jewish restaurant, two distinct moods emerge. The crisp white tablecloths, chic stemware, dark wood furnishings, and immaculately dressed waiters exude fine-dining elegance. But other details—from the father-son chef duo to the time-honored weekly menu highlighting traditional Hungarian and Jewish meals—lend the familiar coziness of dinner at grandma’s house. Striking a great balance between traditional and indulgent is the forte of owner-chef Tibor Rosenstein, and now his son and partner, Róbert. 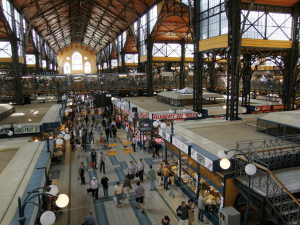 What he started as a tiny buffet in 1996 on a side street next to Keleti Railway station (and which is still in operation next to the restaurant today) has grown into one of the city’s finest restaurants, all thanks to his culinary expertise and entrepreneurial chops. Rosenstein’s menu is made up of Hungarian-Jewish specialties, from gulyás to lecsó (stewed peppers and tomatoes), and lamb knuckles with garlic hremzli (potato pancake) to goose leg with red cabbage. 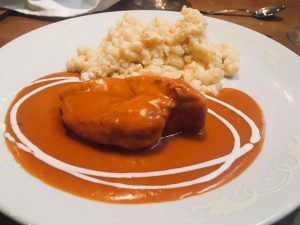 But it is his decadent take on comfort foods—such as töltött káposzta (stuffed cabbage) and Brassói aprópecsenye (a dish made up roasted pork, potatoes, garlic, and paprika)—that really stands out. 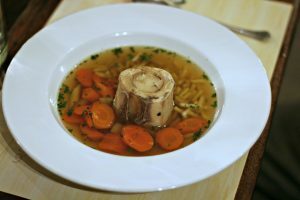 Hungary, with its robust soup, bread and meat traditions, has also infused its own flavors into the vibrant Jewish cuisine which has deep roots in Hungary, and is undergoing somewhat of a renaissance these days. There are plenty of excellent dishes to try at Rosenstein—which has become somewhat of a pilgrimage spot for visitors to Budapest—including the matzo ball soup. But if you are there, you really cannot miss trying the sólet. 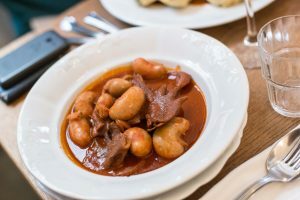 Sólet is the Hungarian take on the Jewish bean stew, cholent, a slow-baked bean stew which is prepared for the Sabbath. The local take, naturally, adds paprika, as well as onions, often boiled eggs, and meat. The type of meat added is largely dependent on the region, customs and wealth of the cook, and can include smoked pork, goose, or duck. At Rosenstein, the sophisticated sólet comes complete with stuffed goose neck, creamy roasted egg, and smoked brisket. It’s a hearty, wonderfully-prepared meal that not only deserves a pilgrimage but also clearly underlines the restaurant’s motto: everything is kosher that tastes good. While the patriarch masterfully prepares classics, Tibor’s son Róbert helps bring the fusion fare into the 21st century. 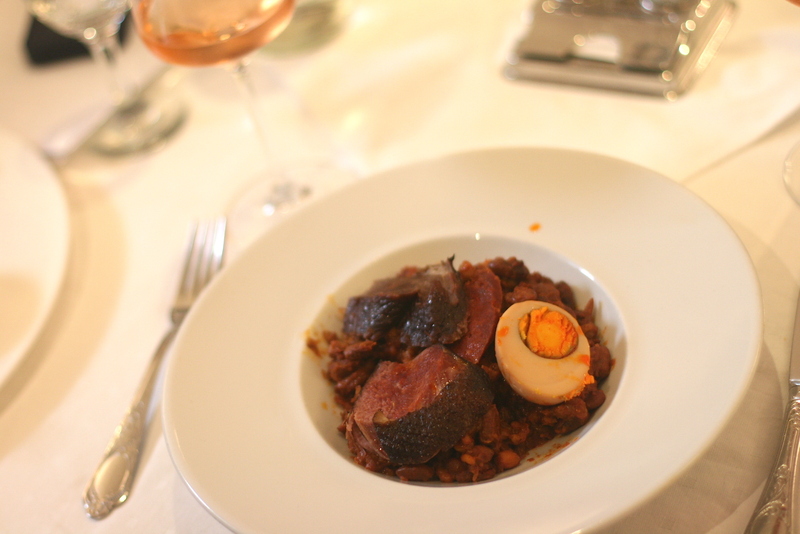 On the menu are modern variations of szalontüdő (lung stew), stewed veal with tarhonya (egg barley) and grilled chicken stuffed with goose liver. On the sweet end of the menu, there is madártej (floating islands), császármorzsa (emperor’s crumbs) and flódni, a traditional Jewish triple-layered pastry filled with ground walnuts, poppy seeds, and apples, slicked with homemade plum jam. Tibor Rosenstein’s excellent cookbook is also available at the restaurant! 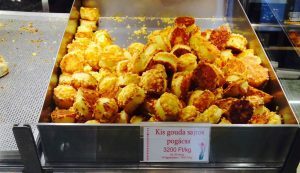 Other Places to Try Sólet In Budapest: Sólet is increasingly appearing on menus in Hungary, and we recommend starting with Fülemüle Étterem and Kádár Étkezde (on Saturdays).